The project is aimed at increasing the understanding, knowledge and experience about electronic participation and engagement for accessing REACH’s services and providing feedback on the services. Furthermore, the project will enhance their basic electronic communication skills and improve their social network skills. REACH Community Health Project is a national third sector organisation with a key strategic role in improving the health, wellbeing and health care provision of Ethnic Minority (EM) communities in Scotland. 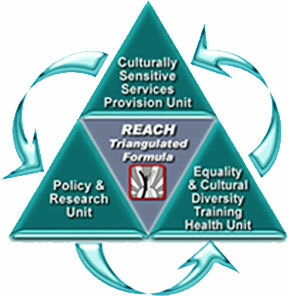 REACH has units engaged in culturally sensitive Service Provision, Policy and Research as well as Training and Development. These areas of expertise act to mutually reinforce one another and the Triangulated Formula makes REACH uniquely placed to tackle health inequalities and service barriers faced by EM communities.